We all know that devices such as smartphones or tablets are multitasking handheld personal computer that are used for several purposes other than calling and texting alone. Today’s mobile devices are used as camera, calendar, television, web browsing, sending e-mail, geolocation, tape recorder, calculator, compass, accelerometer, digital mapping and many other. These features build a strong product value to consumers which gives the possibility for each consumer to personalise their device(s) further by downloading any applications needed and wished resulting to use one single device instead of few for many users. 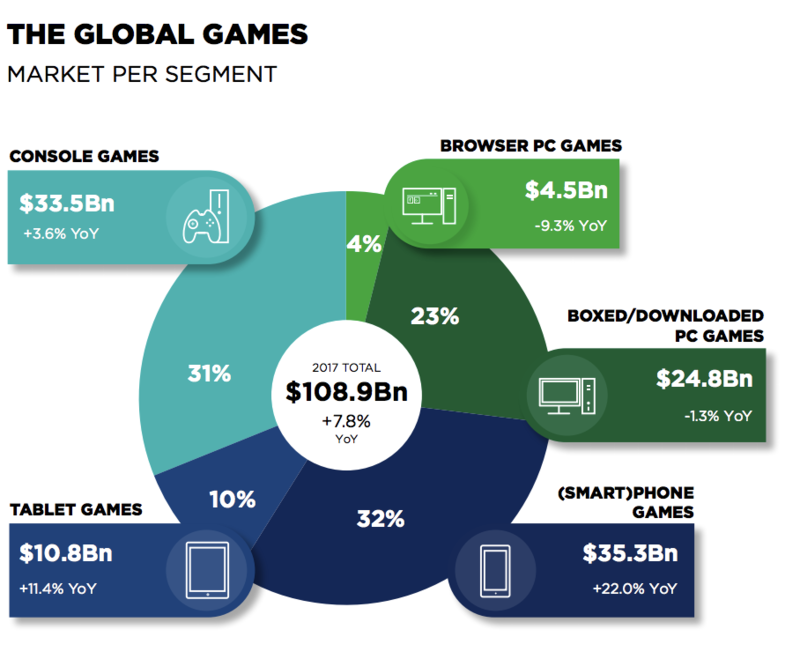 Games are one of the most popular application’s categories, representing a total of 39% of all downloaded applications, generating over $50 billions in revenue worldwide in 2016 which counts up to 81% of mobile store consumer spending (compering to 75% in 2014). 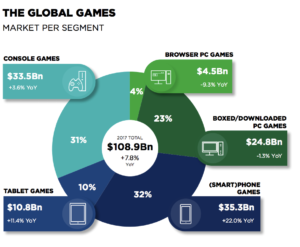 While the gaming industry is growing in terms of profitability counting over $100 billion in revenue in 2016, the thriving preferences to play games on mobile devices seen these past few years resulted last year to generate (for the first time) the biggest source of revenue from the other devices such as PC or even consoles games (32% in total comparing at 31% for consoles and 23% for PC). • Lower cost of production: Due to a far less development costs to create games on smartphones thanks to a far less needs of complicated coding because of smartphone’s smaller screen sizes, lower resolution and processing power, it results to decrease greatly the cost to produce such games. Also, because these are downloaded by the users directly through the device, it negating the need for packaging and shipping, all that resulting to lower as well dramatically the price of the game to the user. • Growing number of smartphone users: We see every year a considerable growing number of smartphone users worldwide (this year, almost 11% increase of smartphone users in comparison to 2016, making in total around 2.4 billion to use such a device), making these games a lot more accessible for any smartphone owner today. • New type of market segment: Not everyone wants complicated games and willing to “waist” their time on time-consuming games. Rather than that, a lot are just looking for quick and easy time-passing games just to entertain themselves for a few laps of time while waiting for a friend, on the bus and other ones. • Makes it possible to play anywhere, anytime: Smartphones gives the possibility to play games anywhere thanks to their size, making them extremely portable oppositely to PC or consoles that requires bigger space and more are more complicated to connect in comparison to smartphones. Many were exposed to augmented reality in 2016 with hit game Pokemon GO, which placed gaming animations within in the real world scenario through a smart camera lens. Augmented reality isn’t just for gaming. Over in the next few years, you will see it expand into other industries like healthcare, books, and of course augmented reality e-commerce. With the launch of iPhone X and ARkit, Now apple can be involved in the world of augmented reality. Google has similarly been experimenting with smartphone AR since it showed off Project TAngo in 2014. After three years company has some great technology but very little in the way of actual users.Google is signaling a reactionary shift in its strategy by releasing a developer preview of ARCore. Google’s ARCore is the answer to Apple’s ARKit. Both Apple and Google are making AR central to their mobile experience. That means companies creating new digital customer experiences can start thinking about how to harness AR for e-commerce purposes. Brands can extend the interactive and transnational experience to customers wherever they are as long as they have a mobile device in hand. Augmented reality eCommerce can personalize the shopping experience for your customers. AR is arranged in such a way that it will increase sales by allowing customers to try before buying and, in turn, reduce returns by removing the initial guesswork. Customers want to know what they’re purchasing and AR is helping customers become more confident in their buying decisions while providing quantifiable differences for online merchants. Overtime there will be tools that will change fashion industry . Which will allow customers to see what clothes look like on them or that show the actual size of the furniture in your space. Instead of an online store showing models wearing clothing, Customers may even able too see themselves in all of the outfits to know which will look on them and this will bring out huge revolution in online retail industry. Computer vision, speech recognition, and natural language processing are all new problems of today’s Big Data world, that are addressed by Deep Learning technologies – an advanced development of machine learning processes. The medicine and beauty treatment industries are certainly getting disrupted by today’s rapidly developing engineering methods. Just this month, an application Face2Gene was launched, which is designed for… identifying rare diseases with A SELFIE! It lets people make a snap of their faces and receive a suggested diagnosis from thousands of different genetic disorders. The mission of the FDNA company, who developed the app, is to help healthcare providers find answers faster in hopes of saving lives and improving patient quality of life. It’s been said that one in 10 people suffer from rare diseases – the system is already covering thousands of disorders that are then being confirmed by a real clinician, this way also improving the app itself with every diagnosis. 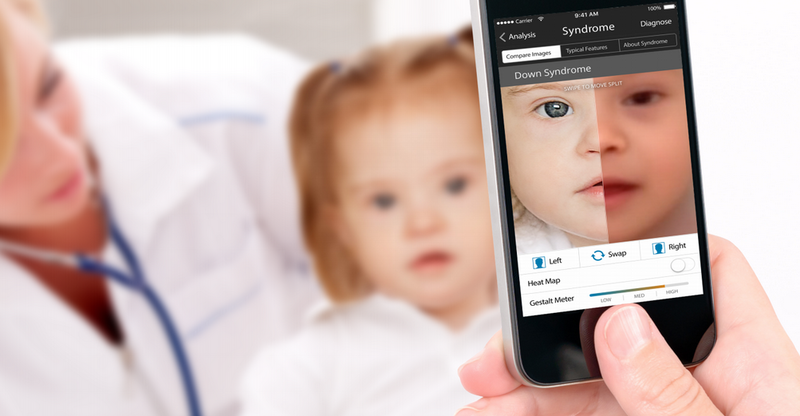 The plans of the founders are to extend the power of the app from identifying syndromes to defining the types of autism, delivered by Nvidia news. And that all is at the same time with another application released by Olay, for being able to snap your skin and receive a detailed recommendation on the areas that need to be addressed with suggested treatments, as an answer to a constant struggle of women in choosing the right products for their needs. 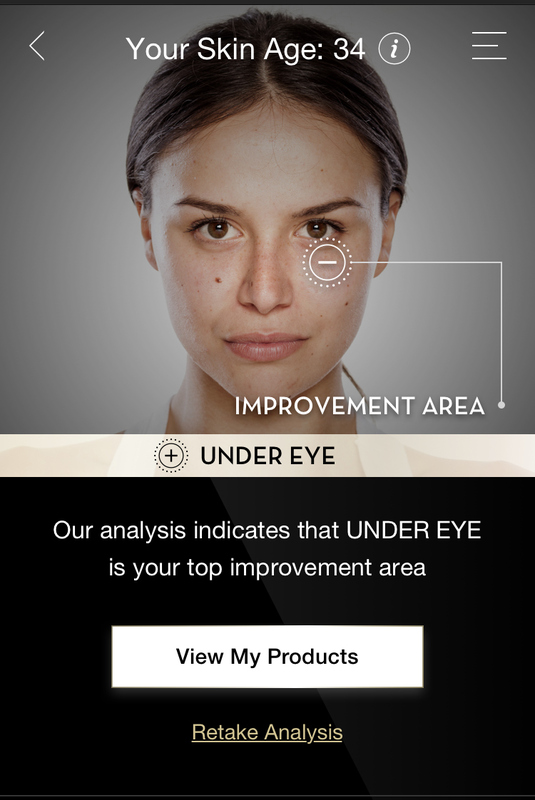 This skin care evaluation app was tested on 50,000 selfies of different aged women and keeps on getting traction. 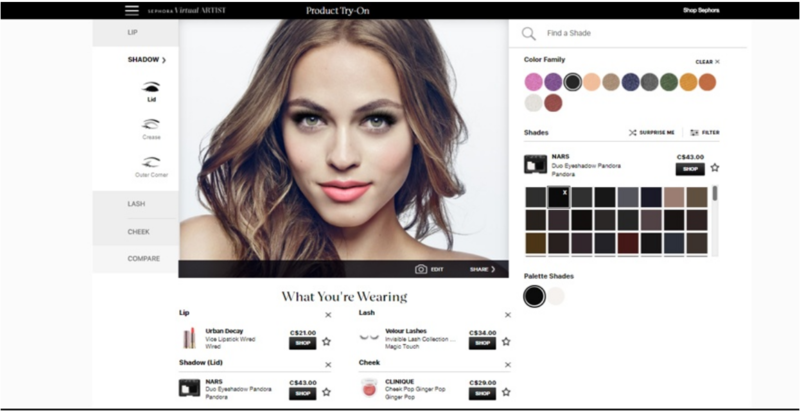 The apps are powered by a combination of facial analysis, deep learning and artificial intelligence, Nvidia news. Deep learning is taking medicine and cosmetology to a whole new level, and that is just a small piece of it! In the United States, Colorado, a truck without a driver made the first delivery of goods on a 200-kilometer journey. The technology that equips the truck was developed by Otto, a young shoot recently acquired by the transport service with driver Uber who feeds big ambitions in this field. When one speaks of autonomous driving, that is to say when the vehicle’s journey is directed by the on-board computer, the very first image that usually comes to mind is that of cars. Inevitably, the communication of the automobile industry on this subject is at least sustained. However, this technology is also very widely deployed in other means of transport. As Futura has already had the opportunity to say, autonomous trucks have a future at least as large, if not more at first, than cars without drivers. It is a very attractive prospect for transport companies to travel long distances by freeing themselves from the rest time requirements of drivers. A market that is so attractive that actors outside the sector are very interested. This is the case of Uber, the service of transport car with driver (vtc) which made this summer the acquisition of Otto. This innovative, US-based company is developing kit equipment to equip existing trucks with autonomous driving functions. Otto announced that a truck without driver equipped with its technology had made a delivery of goods, in this case beer. A world first. Wired magazine, which devotes a report on this subject, recounts that the system used by Otto is not yet able to manage the entire course alone. If he is able to operate on motorways without the help of anyone, he still needs the help of a driver to negotiate the most delicate parts of the journey, whether it is insertion on a Fast track or city driving. The autonomous truck, in which a human driver was present to intervene in the event of a problem, traveled 200 kilometers between Fort Collins and Colorado Springs, Colorado, on the highway. The autonomous driving kit, which includes cameras, lidar and ultrasonic radars, costs $ 30,000 and can be installed on any truck equipped with an automatic transmission. Uber, which is working in parallel with the development of an autonomous car in partnership with Volvo, has already created a freight transport service called UberFreight which invites interested companies to participate in its experiments. But the vtc company is not the only high-tech actor to be interested in trucks. Tesla Motors recently announced its intention to develop a self-propelled truck, the Tesla Semi. Constructors and designers are also working on this concept, which you can see in our article on trucks of the future.